Would you eat a whoopie pie made out of cheese? Whoopie pies: they're not just for dessert anymore. Well, not that you couldn't eat them at any time of day before, but now, thanks to the ever-crass Vulgar Chef, there's a new type of whoopie pie on the block. And it's made entirely out of cheese. 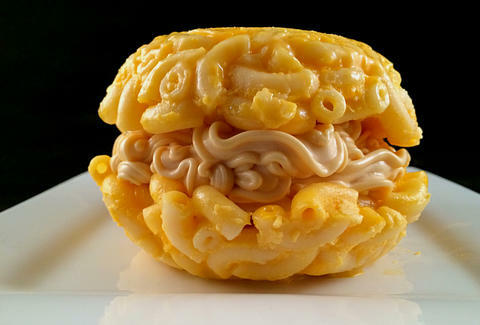 The baked good combines two "buns" made out of mac & cheese mixed together with egg as a kind of glue that holds them together, and the filling is 100% pure, creamy Easy Cheese. From a can. Now that's something sure to make you shout with exuberant joy (the definition of "whoopie", duh). Adam Lapetina is a Food/Drink staff writer for Thrillist, and has never met a whoopie pie he didn't like. Read his musings at @adamlapetina.